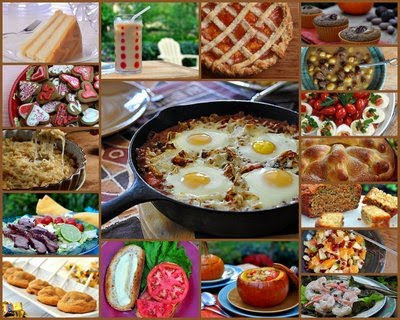 My favorite recipes from 2010, just 12 of the best recipes of the year. Made without processed food, these are everyday recipes, ones to make again and again. They are recipes that express the hallmarks of the Kitchen Parade style, 'fresh' and 'easy' and 'flavor-forward' and 'seasonal'. But honestly, Kitchen Parade may come from my heart but without readers like Patricia -- without YOU as a reader -- and without your encouragement whether in comments, Facebooks "likes" or an e-mail subscription, this website would be a much lesser place, it might not exist at all. So let ME thank you, for reading, for your encouragement, for your trust, for your curiosity, for the privilege of sharing kitchens. In the center, the very first shot, straight out of the camera, no reading, no manual, of my much-loved Nikon D90 and its 35mm wide-angle lens. I'm still learning my way around the camera but my, how Nikon and I think alike. The recipe is Refried Bean Sauce with Eggs on Top. Best-Ever Caramel Cake, Cold-Brewed Coffee for Ice Coffee, First-Prize Peach Pie with Lattice Crust, Perfect Whole Wheat Pumpkin Muffins, Spicy Raisin Sauce for Ham, Deviled Eggs with Tomato & Herb Relish in tribute to my friend Linda, Pan de Muerto ('Bread of the Dead' Celebration Bread), Carrot & Zucchini Bread, Mexican Fruit Salad, Cold Shrimp in Creamy Dill Sauce with Capers, Fall Stew Baked in a Whole Pumpkin, Homemade Mayonnaise for BLTs, Snickers Cookies on Sticks or NOT, Grilled Steak with Summer Tomato Salad, Julia Child's Soubise (Onion & Rice Casserole), Cut-Out Spice Cookies. My favorite recipe list would have to include the Fall Stew Baked in a Pumpkin. When our CSA delivered several small squash, including a couple of pumpkins, I made this for my picky family of 6. I left out the cheese in mine, as I can't eat dairy, and it was still delicious. Everyone loved it and I made it again as an entree on Thanksgiving for my vegetarian teenager. Thanks for a recipe that will become a fall tradition in our house.